Volant Power Core Air Filter: MAINTENANCE FREE FOR 100,000 MILES! Its time to equip your Volant intake with Volant's PowerCore DRY filter. 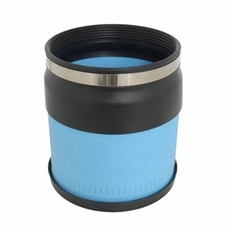 This unique filter does not require any oiling or maintenance like traditional (ie K&N etc) filters do. You can simply clean it with a shop vac in seconds if you would like to do so, but keep in mind, maintenance is not required for 100,000 miles! You won't have to worry about oil from your filter causing problems with your mass air flow sensor with this DRY filter either! This filter is built to last and its uniquely shaped flutes can hold up to two pounds of dirt before becoming clogged. Even better, this filter exceeds oem standards, with a filtration rate of over 99% No oiling, less cleaning, more reliability and better filtration. What more can you ask for? This item is intended to replace a filter in a Volant Air Intake System. These filters are NOT for Factory Air Intakes, only Volant Intakes.